For all of the fun and frustration driving brings with it, it is still one of the most dangerous things you do on a day-to-day basis. Despite the fact that cars are safer than ever, they are still driven by human beings who, let's face it, sometimes struggle to turn on a computer, or walk through a doorway without banging their elbow. 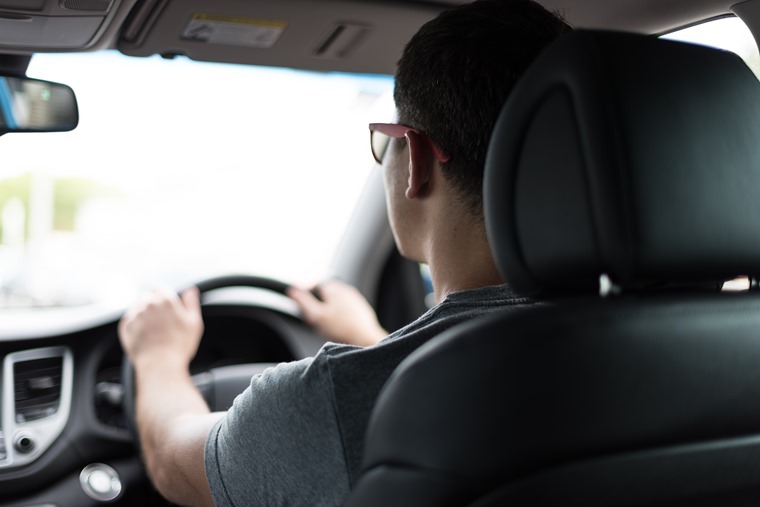 “Check your blind spot…” said the driving instructor as you, a 17-year-old sweating your way through the first driving lesson, check your mirrors, signal, then awkwardly look over your shoulder. But what if I told you there was no blind spot? If you can’t cast your mind that far back, let me remind you that the blind spot is the area on either side of your car which can’t be seen in your wing mirrors or rear view. It’s such a traditional cause of accidents that most current models now come with blind spot assist which will beep and/or flash in your wing mirror if a car is in another lane or is passing you. 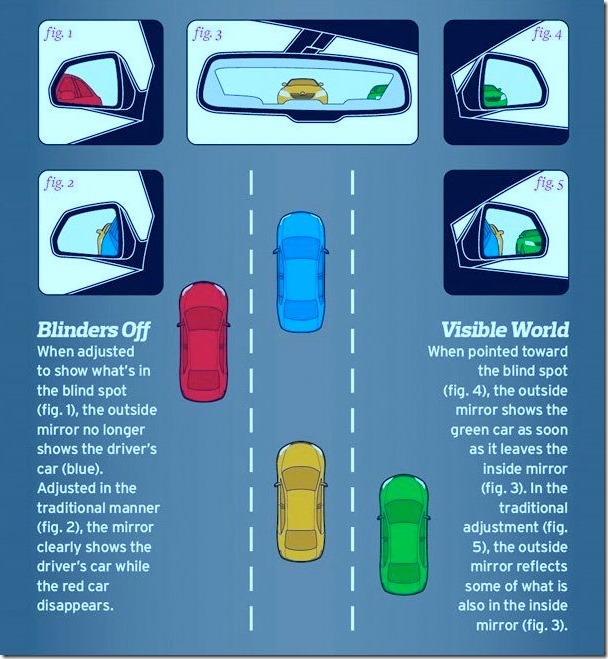 As great as blind spot assist is, the key to fixing any blind spot is, well, the mirrors themselves. They just need to be adjusted properly, according to Car and Driver. The blind spot in your wing mirrors occurs when you can see your own car in them. “But my instructor told me I should be able to see the handle of the door,” I hear you reply. Well listen to your Uncle Neil because I’m telling you they should be angled away until no part of your car can be seen. 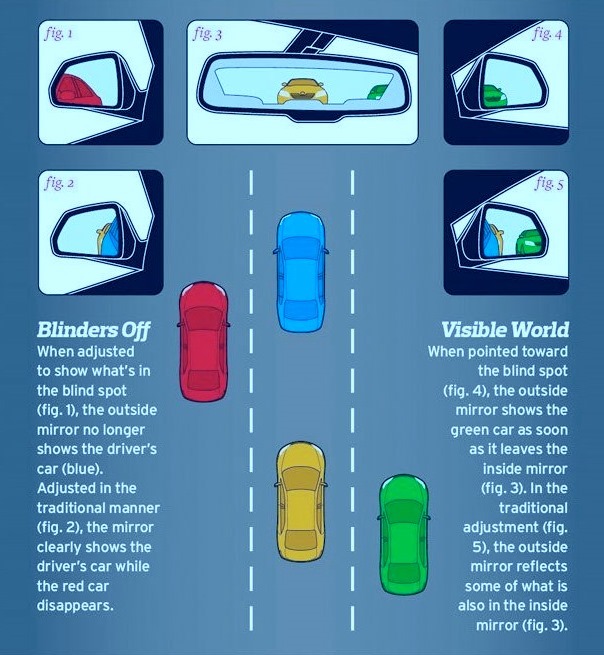 Doing this means there’s no overlap between your wing mirrors and rear view ensuring that any car passing you or occupying a lane you wish to join will remain in one of the three mirrors until it enters your field of vision. Hey presto, no blind spot. Annoying innit. But there will come a time when you really do need to stop quickly. And when that happens you should really really really stand on your brakes with all your power. The sad fact is that some accidents occur because drivers casually brake rather than slamming them on at sight of a hazard but modern brakes and tyres are great and they can take the strain. The reason? Every car sold since 2004 has to have anti-lock brakes as standard so there will be no danger of the car locking up as a result of heavy braking. If your car also has electronic stability control too you’ll be even safer. Most current cars even come with automatic emergency braking for added security on top of all that. I get it, the faster the car the lower down and further away from the steering wheel you need to be for maximum coolness. But wouldn’t you rather have full control over your vehicle than look cool? It’s not just me surely. 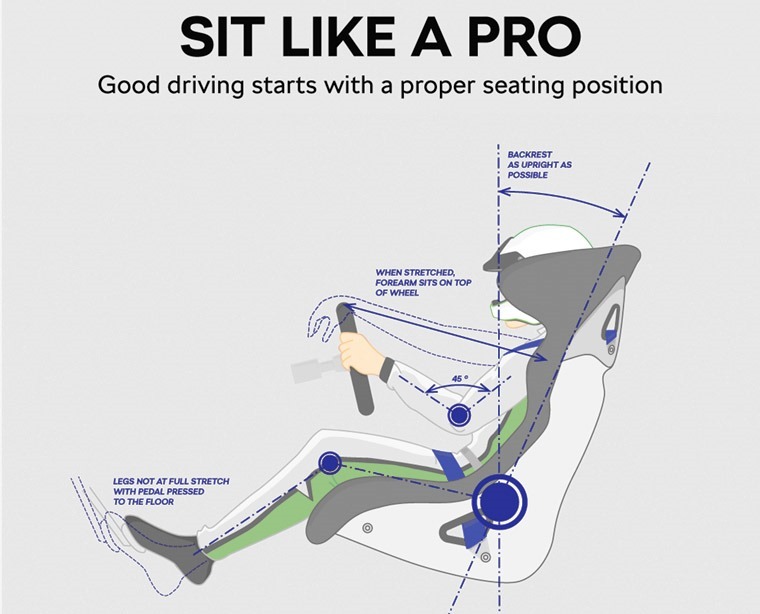 Like the automotive equivalent of Goldilocks, finding the correct driving position may involve a bit of trial and error before it’s just right but here’s a few tips to ensure you’re in the correct position, courtesy of Skoda Motorsport. To begin, move the seat so you have an unobstructed view of the instrument panel as well as around the car. Once you’re happy with this, then press the clutch in and let it go. If your leg is straight when it’s pushed down then move your seat forward, if it’s 90 degrees then move it back until your leg is slightly bent at the end of its travel. Now it’s time to focus on your arms and the steering wheel. These should be bent at a comparable angle to your clutch leg, with your wrists able to sit on top of the steering wheel. If you’ve got a telescopic adjustable steering wheel it makes this a lot easier, if not adjust it up or down to suit. Oh, and remember all that talk about driving with your hands at 10 and 2 o’clock? That’s outdated. Holding your hands too high risks injury if the airbag deploys. The recommended position is now at 9 and 3 and your thumbs should be placed on the rim of the wheel, not wrapped inside it. In the event of an accident, the force of the airbag going off can break thumbs/hands and fling arms into faces. In the extreme it can even cause something called ‘de-gloving’. Don’t Google Image search it unless you have a strong stomach. That’s another tip. The Department for Transport has recently announced that vehicle drivers and passengers will soon be encouraged to use the Dutch reach when opening doors from the inside. It’s quite fitting considering the theme for this year’s Road Safety Week encourages everyone to be Bike Smart. So what exactly is the Dutch reach? It involves opening a car door by turning and using the hand furthest from the handle. The idea is that it forces occupants to look over their shoulder before swinging the door open as a cyclist rides past. The air recirculation button is a bit of a mystery to some. When should it be used? What’s the point? All valid questions, but let’s get one thing out of the way first: you shouldn’t be using it now, in winter. Turning your blowers on full and cranking up the temperature to try and de-fog your windows, you may be tempted to push this button hoping it will clear them faster. Now hold on there. As it recirculates the air, all you will really be doing is sending the air in the cabin around again and it will take longer than it should have to clear.